A very good boy in the Chicago Police Department is getting widespread praise after it helped make a huge $10 million pot bust on Sunday. During a traffic stop, a dog on the narcotics unit sniffed out what turned out to be more than 1,500 pounds of marijuana inside a vehicle, police said. In a Facebook post, the Chicago Police Department said officers were conducting a narcotics investigation that led police to a traffic stop of a vehicle suspected of drug trafficking. "A Police canine alerted to the scent of narcotics and a subsequent search of the vehicle resulted in over 1500 pounds of cannabis products with a street value of over $10,000,000 being recovered," police said. Photos in the post show weed packaged in hundreds of bags stacked high inside an evidence room. The four-legged investigator was also pictured, sitting proudly in the room with his bounty around it. 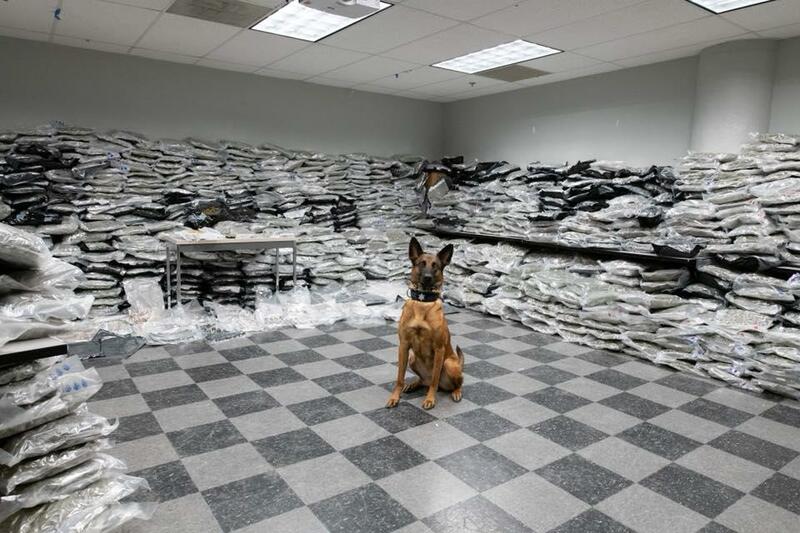 The post detailing the massive drug bust has been shared more than 7,000 times on Facebook, with many commenters giving props to the dog. Officers learned the drugs were en route to Chicago from California, according to investigators. The driver of the vehicle, 42-year-old Jason Tanner, was placed under arrest and charged with cannabis possession of more than 5,000 grams, CBS Chicago reports. The Chicago Police Department thanked the officers involved for their "hard work in this large narcotics seizure."